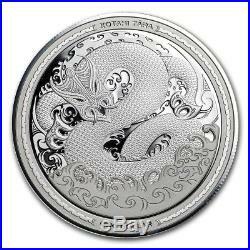 The dragon-shark Taniwha, one of the Guardian Spirits of the Maori of New Zealand, emerges from the sea on these one troy ounce pure silver and gold proofs in this superb, luxurious, investment grade 2-coin proof set - with a tiny mintage limit of just 80! While other cultures have dragons, serpents, and other mythical beasts at the root of their legends, the Maori of New Zealand have the terrifying taniwha. The dominant force in many Mori myths, the huge taniwha dwell primarily in the water, preferring deep pools in lakes, in river rapids, or in the rough waters and rips currents of the ocean surf. This powerful and monstrous creature is the subject of this extremely limited edition. A mintage limit more typical of 5 Oz and larger gold coins! 2-coin gold and silver proof set. 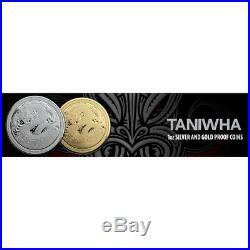 Only eighty (that's right, 80) Taniwha 2-coin sets were issued. They are truly rare and virtually impossible to find - investment grade, indeed! 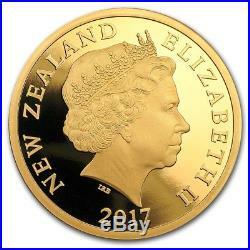 The issue price for the Taniwha 1 Troy Ounce Pure Gold Proof (by itself; not the 2-coin set) is NZD 3,449.00. Which means you get this incredibly rare, mintage of 80 2-coin proof set for less than 80% of the issue price of the gold proof alone! But at our rock bottom, wholesale-direct price, you acquire this beautiful and impressive set with a tremendous amount of built-in appreciation! The fighting spirit of the Maori is revered the world over! 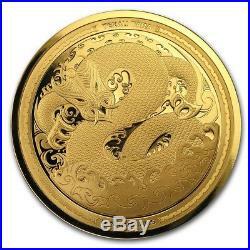 Now you can acquire one of their guardian spirits, the dragon-like Taniwha, to watch over your precious metals holdings (and everyone loves to collect dragon coins)! Both coins reside inside an intricately carved. Made from New Zealand heart. 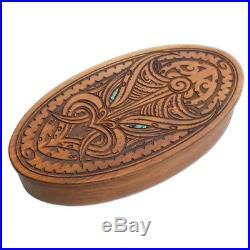 Features a beautifully crafted taniwha design, with. Shell (abalone mother of pearl) inlays for the eyes. Each set is accompanied by an individually numbered certificate of authenticity. The Legend of the Taniwha, the Maori Dragon-Shark. Are spirit beings that live in deep pools in rivers, dark caves, or in the sea, especially in places with dangerous currents, undertow, deceptive breakers, and giant waves. Some are considered highly respected. (protective guardians) of different peoples, tribes and places, while others are dangerous, predatory beings, which might kidnap women to take as wives. At sea, a taniwha often appears as a huge shark the size of a whale or bigger! In fact, the Mori name for the Great White Shark is. In inland waters, taniwha may still be of whale-like dimensions, but look more like a lizard or a tuatara, having a row of spines along the back. Other taniwha appear in forms of serpentine, dragon-like (both in eastern and western lores), crocodile-like, and megalania-like, with fiery eyes and lashing tails. Some taniwha can tunnel through the earth, uprooting trees in the process. Legends credit certain taniwha with creating harbors by carving out a channel to the ocean. Other taniwha allegedly caused landslides beside lakes or rivers. Taniwha can either be male or female. In some Maori lore, Taniwhas are reputed to spray toxic urine during combat, or to cause natural disasters when agitated. Some taniwha have associations with tribal groups; each group has a taniwha of its own. When accorded appropriate and due respect, taniwha usually behave well towards their people. Taniwha acted as guardians by warning of the approach of enemies, communicating the information via a priest who was a medium. Sometimes a taniwha may save people from drowning. Because they live in dangerous or dark and gloomy places, people are careful to placate the taniwha with appropriate offerings if they need to be in the vicinity or to pass by its lair. In their role as guardians, taniwha are vigilant to ensure that people respect the restrictions imposed by. They make certain that any violations of. Taniwha are especially dangerous to people from other tribes. There are many legends of battles with taniwha, both on land and at sea. Often these conflicts took place soon after the settlement of New Zealand, generally after a taniwha had attacked and eaten a person from another tribe. Human adversaries often manage to outwit and defeat the taniwha. Many of these taniwha are described as beings of dragon- or lizard-like form. In some of the stories the huge beasts are cut up and eaten by their slayers. Only eighty (that's right - 80) gold and silver proof sets were issued. 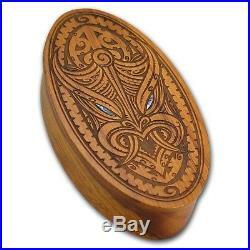 The coins are housed in Maori treasure chests, carved of native materials. Did we mention that the coin design is phenomenal, and the taniwha are terrifying? The obverse depicts the taniwha, subject of many Maori myths and legends, emerging from the turbulent waters that are said to be its favored habitat. The ferocity and detailed characteristics of the taniwha are beautifully illustrated by New Zealand native artist Dave Burke. The denomination is indicated twice: a the top, in Maori, as KOTAHI TARA (One Dollar) or TEKAU TARA (Ten Dollars), and at the bottom in English, as ONE DOLLAR or TEN DOLLARS. 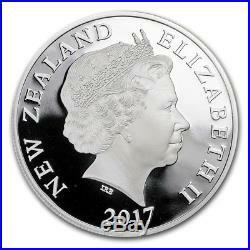 The reverse features Her Majesty, Queen Elizabeth II. In crowned profile facing right. This portrait, featuring Her Majesty wearing a tiara and pearl earrings, was executed by the sculptor Ian Rank-Broadley. The legend ELIZABETH II and the date are indicated. 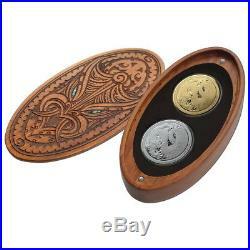 Both coins are encapsulated and reside inside an intricately carved waka huia (Maori treasure chest). Made from New Zealand native heart rimu (native red pine), the wakahuia features a beautifully crafted taniwha design, with paua shell (abalone mother of pearl) inlays for the eyes. Gold: 31.107 g Silver. Gold: 38.7 mm Silver: 40 mm. David Burke (obverse) Ian Rank-Broadley (reverse). 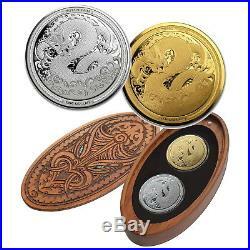 The item "New Zealand 2017 Taniwha Maori Dragon 2-Coin Gold + Silver NZ Prf Set MINTAGE 80" is in sale since Saturday, September 23, 2017. This item is in the category "Coins & Paper Money\Coins\ World\Australia & Oceania\Australia\Commemorative". The seller is "talismancoins" and is located in Saint Louis, Missouri.